Or more particularly let’s talk about non-resident trustees and the non-complying trust. Like Ivanka Trump I had a punk phase. Unlike Ivanka mine was actually punk and not grunge. And lasted longer than a day. Largely consisted of having orangish spiky hair from late seventh form until I had to get a real job as an accountant. And yeah ‘ real job as an accountant’ not very rock and roll. But I could do the safety pin in my ear thing – albeit through my piercing. And I just loved the music. Still do. So much so that when the Paradise Papers broke – 30 years after I grew out the spikes – all I had in my head was the Stiff Little Fingers. And the paradise reference now is not to an alternative Ulster. It is to Bermuda. A sunny place for shady people. Oh and the Queen. So from British Virgin Islands to Panama to Bermuda. From Portcullis to Mossack Fonsceca to Appleby. The ICIJ strikes again. Well done boys. Rich people investing their money through complex structures involving sovereign Island nations. Now of course investing in such places is only illegit if it conceals income that would otherwise be taxable somewhere else. And as for HM; she is a voluntary taxpayer – oxymoronic I know – so anything she does is totes legit. 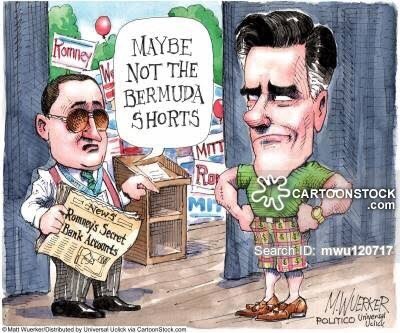 For everyone else it must be the amazing fund management service that Bermuda offers. Coz you know London is such a backwater. But what does this all mean for New Zealand? To me this is a far bigger deal than the foreign trusts. With them our reputation was at risk. Here actual New Zealand tax could be at risk. But first some background. Breathe and take it slowly. Rest when you need. On the whole New Zealand – like pretty much all OECD countries taxes tax residents on New Zealand and foreign income and non-residents on New Zealand income only. And the corollary of that is not taxing the foreign income of non-residents. Which is a shame as you don’t get a bigger tax base. But mutually assured distruction if anyone tried. So far so good. But issues abound when income is earned through companies or trusts and not directly by a real person. Maybe dear readers a good time to go back and refresh. Now with trusts there is the person who hands over the dosh to the trust – settlor; the person wot legally owns the dosh – trustee and the person for whom this is all for – the beneficiary. Anyone of them would be a reasonable target for the ‘who should we tax’ game of residence. Most countries target the trustee. As that is the legal owner. New Zealand targets the settlor. As they apparently call the shots. Which does seems bordeline fraudulent given they have given away legal ownership. But I digress. All which is how foreign trusts generally have resident trustees. A foreign trust – and the associated foreign sourced income exemption – only happens if it is settled by someone who isn’t a New Zealand resident. So the foreign bit relates to the person putting the money into the trust rather than the legal owner; income source or beneficiary. Distributions are tax free to foreigners; to New Zealanders just their normal tax rate. Complying trust. Effectively full residence taxation with the wheeze that if tax is paid by the trustee; distributions can come out tax free. This is all trusts with New Zealand settlors and New Zealand trustees. Or New Zealand settlors and foreign trustees who have elected to be a complying trust. Non-complying trust. A trust that isn’t a complying trust or a foreign trust. Effectively a trust with New Zealand settlors and foreign trustees. The potential world of the Paradise Papers. Distributions – like dividends – have a transfer of value definition. So let’s say under a trust deed you get you to use a house rent free and that house is in a trust settled by a non-resident. Then the value of that stay is taxable at normal tax rates if it is a foreign trust. 45% if a New Zealander has given the trust any dosh as well and it is a non-complying trust. Have to assume Mojo Mathers was 100% comfortable with her tax compliance when she told her story. Taxation of foreign income is still a thing for non-resident trustees if a New Zealander has made a settlement after December 1987. Now you might think hah – the trustee is offshore – bah hoo sux Mrs Commissioner. Well you might think that but you would be wrong. New Zealand settlors are liable – as agents – for that tax. But surely no New Zealanders are involved? Well that might be true. The past incarnation of this – Portcullis – picked up a Green Party donor. Now he admitted to the Trust but as he was based in the United Kingdom potentially no tax issue for New Zealand. There is also an unnamed blog that details quite interesting tax behaviour of people who look awfully like New Zealanders. And last time in 2013 IRD was pretty hot on it all. Can we improve the situation? Absolutely we can dear readers. Thanks for asking. Now IMHO it is completely insane that there is no form of disclosure of settlements or interests in offshore trusts. Now the underlying law is pretty ok but should we have to rely on the ICIJ to get tax compliance? Taxpayers know if they have these interests but Inland Revenue would have no clue without the ICIJ. There are disclosures of interests in foreign companies and now foreign trusts have to tell IRD about their inner workings. But offshore trusts of New Zealanders who just might be hiding things. Nowt. Now there is the argument that if people want to be deceptive they also won’t disclose. And that is true. But all these people will have tax agents who as part of their compliance will need to ask each year if they have any. This will give them the opportunity to explain the law and the risks. And yeah they might lie to their agents too. But this is all narrowing the non-compliant group who then become super at risk next time ICIJ gets busy. And this may even help our National Accounts. Coz you know that thing about how New Zealanders don’t save? Maybe some of this lost money is in an undisclosed offshore trust? Just maybe. This stuff is just hard. And in a world where the department is salary cutting or simply disestablishing the jobs of the people that can do this work; I am nervous. Service just won’t deal with these people. Hard nosed enforcement is needed. Please Hon Stu fix this. Over the last ten years or so officials in OECD countries have been signing Tax Information Exchange Agreements with countries formerly known as tax havens. Wonderful PR for Ministers who look like they are actually doing something. And when this all broke I thought cool; the Bermuda TIEA could be used. Except while it was signed in 2009. It is not yet in force. Ie we are totally on a promise until that happens. Now Hon Stu. Your colleagues are busy sorting out the messes from the last government. Looking forward to you fixing this after you have sorted out the restructure. Because until this is all done, without the ICIJ, offshore Trusts really can be paradise for New Zealanders who want to hide. SLF playing in Wellington in February! I’ll be there. Do you think it’s a bad look for the New Zealand Super Fund to be using these same offshore structures to “avoid paying too much tax”? The Super Fund invests alongside the big boys who are there to gain access to investments they couldn’t otherwise reach. To me the issue is ehy are the big boys there. I am not sure how much being in those places actually helps the Super Fund tax wise as they would be FIF investments subject to NZ taxation. If anything it shifts their tax payments from offshore to NZ. To this casual observer, the local cohorts of the ICIJ are holding evidence of tax wrong-doing – yet aren’t handing it over to the authorities. So, we pay our tax guys less (gals even lesser) AND tie their hands behind their backs. Yep, marvellous. Thanks for the clarification on the trust law. Also for the link to my unnamed blog. It is called Shakespeare Bay. That is a bay just over the hill from Picton, and is part of the port. It is now the centre of raw log exports, and hosts cruise ships. Those are visible exports, whereas we are working on ‘invisibles’. It is unfortunate that we must rely on leaks of documents to know how our legal system is being used to complement other tax haven companies. NZ companies are still used in the offshore structures constructed by law firms like Appleby, and local identities like Kenneth Whitney. Thanks. Go well Shakespeare Bay!